Looking for somewhere super cool, super new and Vegan-friendly to check out over Valentine's Day this year? Go no further than BKA Restaurant in Burleigh Heads! Only opening two months ago, this super cool space is serving up some of the best Vegan-friendly food on the Coast, whipping up French Toast, Spring Rolls, Salt & Pepper Tofu and even Mac & Cheese perfect for Vegans and non-Vegans alike! Kicking off their year with a delicious 4-course Valentine's menu, start your evening with a complimentary cocktail on arrival, then indulge in house-made cheese, mushroom and potato skewers, agave roasted carrots and macadamia-crusted tofu, before finishing off the evening with Berry Panna Cotta and Cointreau Soaked Sponge for dessert! Oh, and did we mention it's just $85 a head for 4-courses and a complimentary cocktail? #YESPLEASE! Is there anything more romantic than a waterfront dinner with your loved one on Valentine's Day? Probably not. Tucked away in the Sanctuary Cove Marine Village, Black Angus Bar & Grill is a hidden gem, whipping up some of the Coast's best seafood and steak to perfectly compliment their beautiful marina views. Priced at $79 a head, enjoy an afternoon or evening of wining and dining with their stunning 3-course set menu, perfectly paired with select wines for a truly romantic day out! Want to make a day out of it? Why not enjoy a romantic walk along their Marina afterwards! Love is in the air at The Star - And all of their restaurant's have caught it! 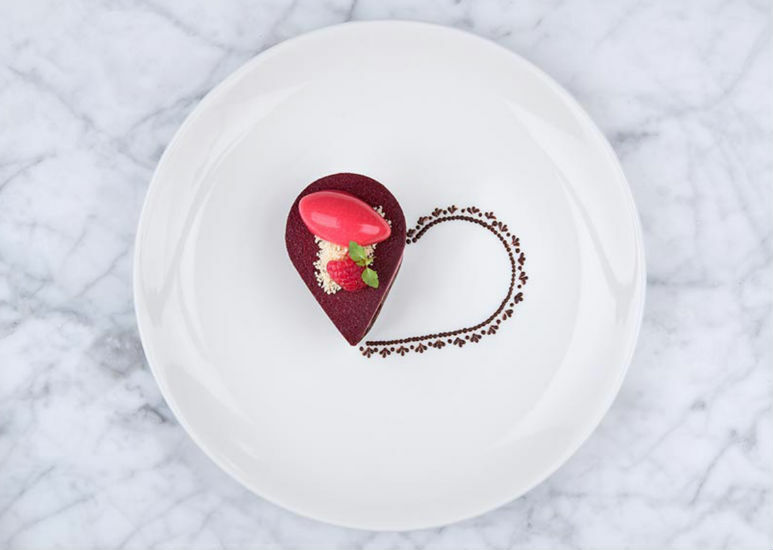 Known for their truly lavish functions, The Star is pulling out all of the stops for Valentine's Day this year, offering totally mouth-watering options from five - yes, five - of their restaurants! Offering options from $40 a head at Kiyomi to a truly lavish $369 a head at Garden Kitchen & Bar, you'll have the opportunity to wine and dine your loved ones with chocolate-dipped strawberries, freshly shucked oysters, carefully curated cocktails and exclusive champagne dinners, with plenty of options to choose from to make the ultimate romantic evening out! Bask in the moonlight at Garden Kitchen & Bar, indulge in a feast at Harvest Buffet or celebrate love on one of the Coast's most stylish rooftop spaces - If you're looking for a truly unforgettable romantic experience, we've found the place to be. Our friend south of the border - Don't worry, we haven't forgotten you! Located in the beautiful Newrybar just South-West of Byron Bay, Harvest is a truly hidden gem - So if you haven't been down there to check it out yet, there's no better time to do it than for Valentine's Day. Go for a scenic drive along the Coast or spend the day at Byron Bay before venturing a little further South for an evening of wining and dining at Harvest! Creating their exclusive Aphrodisiac menu perfect for the beginnings of a romantic evening (no better time than Valentine's! ), you can treat yourself and your lover to a journey of the senses, with an incredible four-course menu complete with carefully chosen beverages for the perfect evening out! Is there anything more romantic than a Valentine's dinner on the water at an award-winning restaurant? We didn't think so either. Located in Marina Mirage right on the water (hello waterfront views), Ristorante Fellini is pulling out all the stops for the most romantic night of the year, carefully curating an indulgent six-course San Valentino dinner for a truly lavish evening of food. Priced at $160 a head, you'll be treated to a complimentary glass of sparkling on arrival before sitting down to a sumptuous six-course feast, beginning with a King Prawn Salad and ending with a limited-release ruby chocolate dessert complete with a 23 carat gold ingot on an almond sponge! Looking to dine like royalty on Valentine's Day? Ristorante Fellini has you covered! Chic, stylish, and classy. When we think of Japanese food, we don't often think of stylish venues and award-winning food - But that's exactly what Yamagen Japanese brings to the plate. Located in QT Hotel in Surfers Paradise, Yamagen produces Japanese food with a twist, creating stylish, stunning food perfect for a romantic evening out. Priced at $99 a head, you'll be treated like royalty as soon as you step through their dark exterior, with a complimentary glass of bubbles on arrival and plenty of live music to help set the mood! Creating their exclusive Omakase set menu for the evening, you'll be treated to culinary delights such as thinly sliced snapper and miso black cod - But with a limited number of spaces, you won't want to wait too long! Are you more of a buffet kind of person than a fancy sit-down dinner person? Bazaar in Surfers Paradise has you covered, and if you don't get there you're totally missing out. Open for bookings at 5:30pm and 8pm, Bazaar is one of the best buffets on the Coast, stocking fresh seafood, slow-roasted meat, Asian treats and stunning salads to please basically everyone! Staying true to the theme of love the sweets won't be in short supply, with a huge range of desserts and plenty of chocolate-covered strawberries to go round, as well as Cupid herself making an appearance to make all of your Valentine's wishes come true! Oh, and did we mention you'll get a polaroid photo of yourself and your honey to take home? Cuuuute!! Ok - If you haven't heard of White Rhino yet, you've probably been living under a rock. Opening towards the end of last year, White Rhino has quickly become one of the hottest spaces in Surfers Paradise, complete with two floors, a stunning water wall behind the bar and an entire tree in the centre of the space! Already known for throwing parties just because they can, their Valentine's Day plans are no small feat either, breaking out all the stops to give us a truly unforgettable night in one of the coolest new spaces on the Coast. Priced at $65 per person (yes, just $65!) and kicking off at 6pm, you'll be treated a glass of rosé on arrival before settling down to enjoy entrees, mains and dessert, finishing it all up with a specially-created cocktail for two! We'll see you there! Our Northern Gold Coast friends - Don't worry, we haven't forgotten you! Many of us have heard of or been down to the Southport Sharks at least once in our lives, but did you know they've got a super cool space called Carmody's that's hosting a totally incredible Valentine's Day event? Now you do! Open from 6pm - We strongly recommend you book - Carmody's is crafting the perfect Valentine's Day menu for just about everyone, complete with a glass of Peroni on arrival for the gents and a totally mouth-watering three-course menu that you won't want to miss! Starting off with a seafood platter for two, you can indulge in Moreton Bay Bug Sliders, Poached Prawns, Oyster Shots and more, before moving onto a choice of Salmon, Beef or Pork Belly for mains. Finishing off the night, Carmody's head chef is creating the ultimate dessert - A ruby chocolate Panna Cotta with gold dusted Meringue, Boysenberry and Rose Coulis and Blood Orange Sorbet! Oh, and did we mention that women get a complimentary box of chocolates on arrival? #WINNING! We love Baskk. The sea views, the relaxed atmosphere and the stunning menu - The whole area just screams Gold Coast lifestyle and we totally love it! Open from 4pm until late and right across from Coolangatta Beach, Baskk is the perfect place to go for a relaxed dinner this Valentine's, with a totally mouth-watering new menu that we guarantee you'll love! Serving up fresh Fish, Prawn and Scallop Pasta, Chicken Salad as well as one of the coolest Pizza ranges we've ever seen, there's plenty of incredible dishes to choose from - And with an incredible cocktail to match, you'll never want to leave!